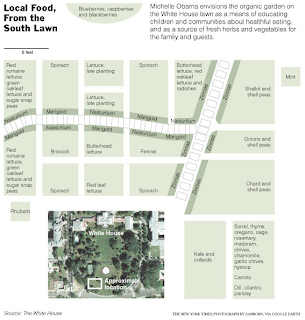 Gardeners are abuzz with the news that ground will soon be turned on a new food garden for the White House, replacing some of the lawn. Everybody is commending the Obamas for leading the way in a movement that will improve health and save money for millions of Americans if they will follow suit. It looks like a lovely garden, but doesn't it seem to be missing a few things? There are greens, greens, more greens, peas, onions, broccoli, an herb garden, some rhubarb, a berry patch (and apparently there will even be beehives), but couldn't there be a place, for, say, some tomatoes? Or carrots, potatoes, beans, cucumbers, squash, or melons? Honestly, are they going to eat all that lettuce by plain? Well, they say you should start small, that your first vegetable garden shouldn't be too complicated or you'll want to quit before you even really get started. Since the family living there has never had a garden before, I suppose they should be an example not only in self-reliance but also moderation. When you look at the image, it says it is the "Spring" garden. I know you are growing in a colder climate with a shorter growing season. I am also in VA and DC is probably Zone 6 (I am in Zone 7). After they pull out the peas, for instance, things like tomatoes and summer squashes can go in. When we garden here in the south, we can garden for several seasons, having spring, summer, and fall plantings. I suspect that is the reason there are missing in that diagram! LOL! Islandgardener is right, of course. Those are all cool-season crops. Here in zone 3, though, there's not really time to grow anything to maturity before the tomatoes go in, so they get their own space all season.